I’m delighted to be the first person (on Amazon) to review the Planetary Anthology: Venus. I’ve been aware of the Superversive SF movement and their publications for a few years now, but this is the first opportunity I’ve had to review any of their works apart from God, Robot. 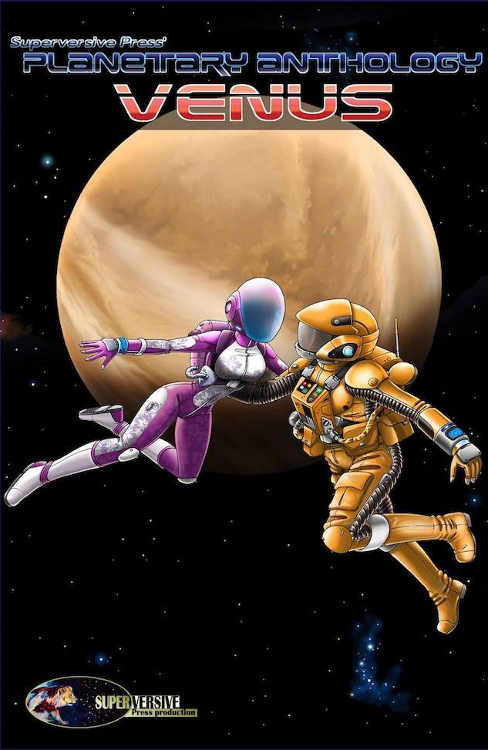 Each anthology in the series takes the theme of a particular planet or other major body in our solar system and asks contributors to create a short story on that theme. In this case, it can be about the planet Venus, but it can also be about the mythological goddess, or even on the wider topic of love and romance (with or without the SciFi/Fantasy elements). One of the motivations for reading an anthology is to become exposed to a wider variety of authors (twenty in the case of “Venus”) and then decide which ones you like well enough to read more of their works. I downloaded “Venus” onto my Kindle Fire and spent a few weeks of lunch hours reading stories and taking notes. They didn’t know Isaac could actually can hear them. They thought he was just talking to John and Robert during lunch period and that he couldn’t tell what was happening just a few feet away. “No! Wait, Diane.” As her girlfriend started to walk forward (a bluff probably), Halley grabbed her arm and pulled her back. “Stay cool, Isaac.” Robert made a salute with his fist. “Later, brother.” John just nodded. They both saw Halley finally start walking toward him and knew he’d need his space. 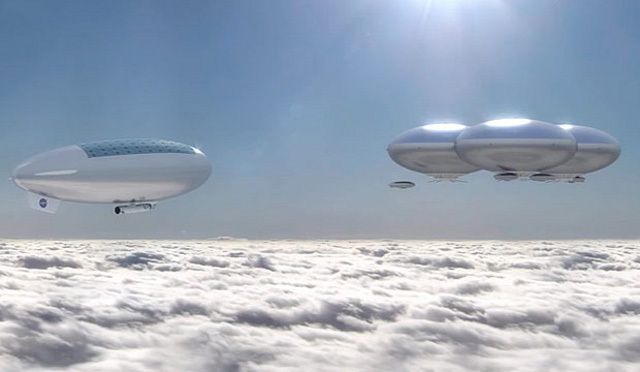 Artist’s concept of a Venus cloud city — a possible future outcome of the High Altitude Venus Operational Concept (HAVOC) plan. Genaro tried to remember what happened. He’d been sleeping a lot lately but it wasn’t a natural sleep. They were trying to keep him quiet so he wouldn’t be a bother. Why couldn’t he see? Why were his arms and legs so heavy? He tried to stand but although he could find the floor, he couldn’t find his feet. Something at the end of his leg was touching something below and to the side of him, but it wasn’t a foot. It was…was… What was it? What had happened? He realized now he couldn’t move his fingers. What was at the end of his arms? Why was it so hard to breathe? He opened his mouth but couldn’t scream. He felt like he was suffocating. His head, yes he still had a head, was aching. The pain spiked and then there was nothingness. 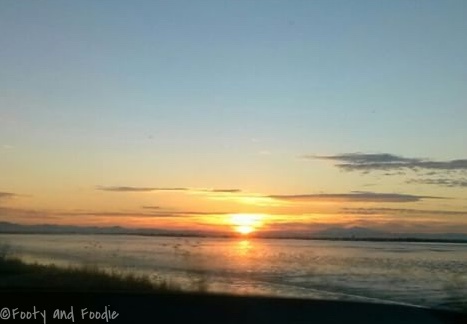 “You never know the blessings you have until they’re gone, Esta.” They stood together at the edge of the shallow sea and watched the sun descend into night. “You mean like Earth is gone, like how we destroyed the biosphere? But it’s not gone, Trent. It’s sitting out there pristine and pure. Can’t we go back to how it is now? I wrote this for the FFfAW Challenge for the Week of November 21, 2017 hosted by Priceless Joy. The idea is to use the image above as a prompt to create a piece of flash fiction between 100 and 175 words long. My word count is 175. I have to admit when I saw the photo, I really did think something like “oh no, not another sunset.” I mean how many stories can you write about a sunset? Then I started thinking about how to tweak this to make it a very unusual sunset. A lot of different ideas came to mind, but then I went to my “files” and revisited the Science Daily article Venus may have been habitable, NASA climate modeling suggests. Based on current climate modeling technology and techniques (which admittedly are far from perfect), some NASA scientists believe that up until about two billion years ago, Venus may have been habitable, possessing shallow oceans, breathable air, and a livable surface temperature. However, being much closer to the Sun than Earth, ultraviolet radiation eventually burned off the oceans and, with no surface water available, carbon dioxide built up leading to a runaway greenhouse effect. 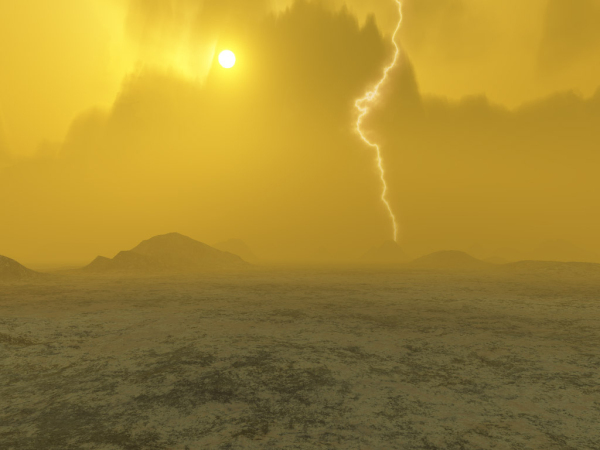 Today, the surface of Venus is a unparalleled hell, with an atmosphere 90 times as thick as Earth’s, acid rains, mega-hurricane winds, and a surface temperature that can go as high as 864 degrees Fahrenheit (462 degrees Celsius). I previously used the concept of a one-way tesseract or temporal gateway leading from Earth’s present to billions of years in the past on another planet in the story The Five Billion Year Love, which I still consider one of my better efforts at a romance, loss, and science fiction tale. In today’s story, the tesseract is a one-way portal from an Earth with an all but unlivable climate to three billion years into the past on Venus when it was habitable. It’s an interesting thought that if humans could save themselves by moving to Venus in the distant past, then would natural events have caused the second planet’s eventual environmental demise or would human beings make the same mistakes twice? “How’s the weather down there?” Jeremy Howard heard Amy Jefferson’s voice in his ears accompanied by just a hint of static. So far it was light banter, but Jefferson was monitoring Howard’s telemetry and she was starting to get worried. George Van Tassel started constructing the Integratron the year I was born. He claimed aliens from Venus gave him the plans, which doesn’t seem likely given Venus’ harsh environment. Surface temperature in excess of 800 degrees, and atmospheric pressure 90 times that of Earth’s at sea level. Not a likely place to find life. The Integratron is supposed to be capable of rejuvenating living tissue, anti-gravity, and time travel, none of which I’m seeing as I stand inside of what is now a tourist attraction. Still, Van Tassel’s sudden death at age 67 has never been explained. Maybe spending too much time in here is damaging instead of healing. I think Van Tassel was contacted, but not by aliens, and certainly nothing wanting to help humans. My name is David Norliss and I investigate spiritual phenomenon. 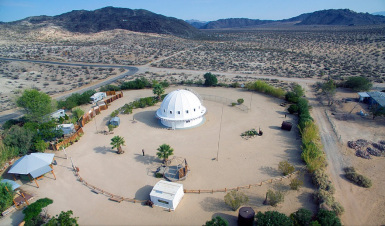 I don’t think aliens gave Van Tassel the plans for the Integratron. I’m looking for demons. I wrote this bit of flash fiction in response to a weekly prompt based on a view from Google Maps. The idea is to write a piece of fiction of around 150 words based on the prompt. Full details can be found at What Pegman Saw. For more stories based on this week’s prompt, visit InLinkz.com. Visit Wikipedia for more information on the Integration as well as its creator George Van Tassel. Oh, I named my character after the protagonist in the 1973 made-for-TV thriller The Norliss Tapes starring Roy Thinnes. This story has a word count of 149. 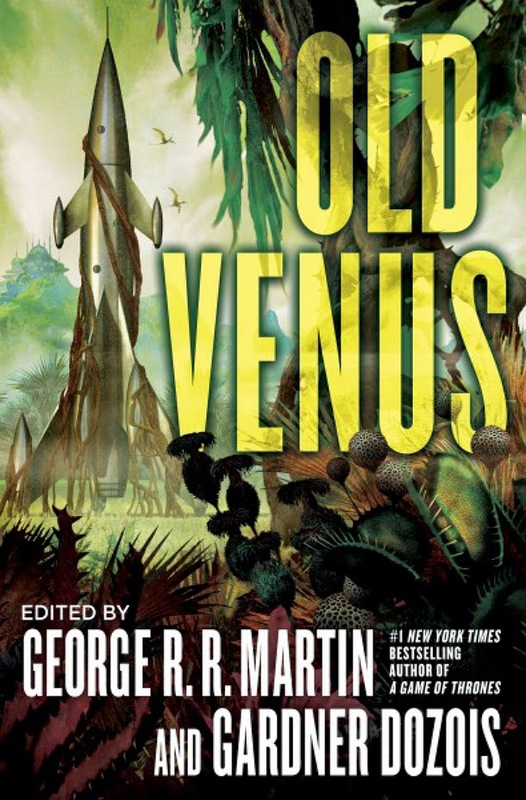 I decided to check Old Venus, an anthology edited by George R.R. Martin and Gardner Dozois, out of my local public library, because I’d already read their Old Mars anthology last fall and enjoyed it. The premise of both books is to get together a bunch of modern science fiction authors and ask them to write stories about Mars (in the case of “Old Mars”) or Venus (in the case of the book being reviewed here) as if it were before about 1960. In the early 1960s, we sent probes to Venus and Mars and discovered one disappointing fact: there’s no way in hell either planet could support life now or probably not even in the dim past. But before we knew that, science fiction writers were crafting wonderfully imaginative tales about both worlds and how we, as well as native Martians and Venusians, could live together and have adventures. What would it be like to just “ignore the rules” and pretend you could visit Venus, with its swamps, rain forests, vast oceans, unending clouds, and dip into the indigenous flora and fauna? “Old Venus” answers that, and in most stories, does so remarkably well. I can’t say I have a favorite story. “Frogheads” by Allen M. Steele was pretty predictable, and “Botanica Veneris: Thirteen Papercuts by Ida Countess Rathangan” by Ian McDonald was too British to hook me and I stopped reading after a few pages (having a headache, slight fever, and recovering from yesterday’s nasal surgery probably didn’t help). “Pale Blue Memories” by Tobias S. Buckell tugged at my heart the most because the racism experienced by our protagonist wasn’t (and isn’t) limited to a single world. Oh, it was also a story depicting an old-fashioned, missile shaped rocket ship, like the one of the cover. “Old Mars” had a similar ship on the cover, but not one story about such a 1950s classic design was between the covers. I was tempted to write such a tale, but got stuck on Arabia Terra, a story I’m not (yet) qualified to write. If you’re going to have such a ship on the cover, make sure one of your stories actually is about such a ship.